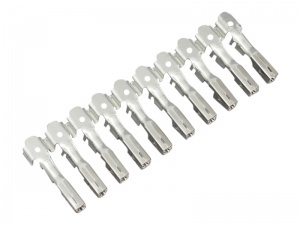 Non-insulated busbar crimp terminals for mini blade fuses. Can be used in any of the modules that hold mini blade fuses from the MTA modular fuse and relay system. 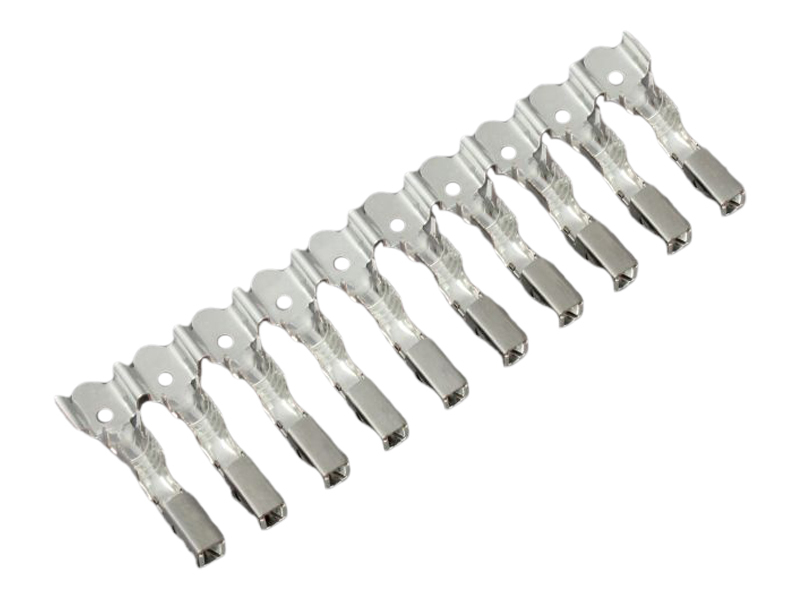 Busbar terminals consist of a row of individual terminals linked on a strip. A single cable connection to one terminal will provide common power to the entire strip, minimising the number of crimps that need to be made. These should be fitted on the input (or battery) side of the fuses only and can be used in a strip of 10 (e.g. 2 strips of 10 in the module with 20 mini blade fuses) or cut down into smaller strips as required (e.g. 2 strips of 3 in the module with 4 micro relays and 6 mini blade fuses). Terminals are crimped and/or soldered to the cable and then inserted into the slots in the underside of the module, with features on the terminals ensuring error-proof insertion. Yellow secondary locking bars on the module should then be pushed into place to prevent accidental terminal removal. Sold as a strip of 10 connected terminals.